Wouldn't it be relaxing to come home to a log cabin every evening? However, if you talk to someone who has actually lived in a log cabin, they may tell you about the maintenance nightmares. Bugs. Logs attract all kinds of insects, especially the wood boring types. Staining or sealing. All wood exposed to weather needs protection from the elements. Air infiltration. A log home should be sealed every couple of years. Splintering. Logs splinter over time and can cause safety concerns. What if your home had the cozy appearance of a log cabin without the maintenance concerns? Could you turn your current home into a log cabin? Yes! Equipped with polystyrene backing for added strength and energy savings. Thicker than most standard vinyl siding for even more durability and strength. Resistant to fading from the sun and weather. 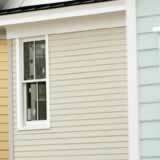 Familiar to most professional vinyl siding contractors, who can offer advice and efficient installation services. Turn your current home into the log cabin you've always wanted. Or or use it on a newly constructed home. You may even consider using it on your children's playhouse, as kids love log cabins, too. Enjoy stress-free cabin living without the maintenance tasks.